The RadioProcessorTM USB Power Supply converts a 12 V (nominal) DC input supply voltage into three regulated voltages, +5V/2A, +6V/1A, and -6V/0.2A, as required by the RadioProcessorTM USB board. 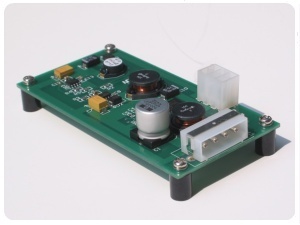 This power supply board is a triple DC/DC voltage conversion circuit design that utilizes switch-mode technology to achieve high power conversion efficiency and thus decrease the operating temperature. It has a wide input voltage range of 7.5 V - 16 V.
The 4-pin input connector is compatible with the standard, dual 12 V and 5 V PC power supply connector. Please see the manual for more details. The 6-pin output connector is pin-compatible with the power connector of RadioProcessorUSB boards, facilitating a simple 1:1 cable connection between boards. The physical size of the board is approximately 5 cm by 10 cm.